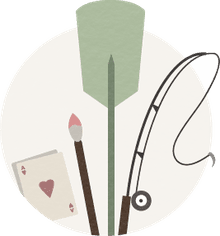 Not sure what to draw, or simply stuck for ideas? Whether you need something to get your class working or to tackle your own frustratingly blank page, here are some ideas to get you started, from simple ideas to developed projects. In a hurry? Check out this short list of drawing ideas. If you're struggling with ideas you can't quite put a finger on, find out how to use a vision board for inspiration. Still life drawing offers many possibilities for the artist. In most types of still life, you can control content, composition, and lighting to a great extent, which makes it an excellent genre in which to explore personal style and technique. Here are six creative still life drawing ideas to get you started. Simple objects can be great subjects, and looking at them in different ways can allow you to explore composition and meaning. Check out Compositions With A Teapot to discover ways to make one simple subject express many different ideas using composition. Landscape drawing can encompass everything from a leaf study in your backyard, to a grand mountain vista. And just as its visual reach is diverse, so is its meaning -- landscape can be simply an exercise in color, or an homage to nature, or a comment on the human condition. Because of its scale, a landscape doesn't theoretically offer you the degree of control that still life does; it tells a different story in terms of your relationship to its elements. You can, however, control selection of subject, time of day, and impose your artistic vision upon it. Take a look at these landscape drawing ideas for some ways to approach landscape. Can't get out to find a view? Try one of these landscape reference photos for inspiration. Drawing portraits is a demanding task -- the subtle differences that make each human face unique can be a real challenge. Luckily, there are some great tips and ideas to help with developing and extending your skills in portrait drawing. Ask friends or family to model arms, legs, heads and shoulders. Use a dark background and directional lamps to create dramatic lighting. Do pages of 'the tricky bits'. Look critically at your work - what do you most need to practice? 'The Body as Landscape' -- try doing detailed sections of the figure, with great attention to detail and subtlety of tone. The great tradition of figure drawing and painting can weigh heavily on an artist. What makes a life drawing contemporary? Look at the pose, composition, and drawing technique for elements of the modern. Take a look at some old master drawings. Carefully observe their linework, hatching, and shading. Copy and make notes about their technique to refer to next time you are in the drawing studio. Do a series of drawing on the stages of life. You could use photos of the same person, or draw different people from life, or a mix of both. Draw a baby, toddler, preschooler, junior, middle and high school age child, teenager and adult through to old age. What special treatment do the drawings need for each age? Think about color (or the absence of color), lightness or strength of drawing, composition, detail. What changes through each stage? If drawing one person, look for characteristics that remain constant. If you have your own pet to draw, you'll always have a model at hand. But if you are having trouble finding reference material, plan a trip to the zoo, or ask a local animal shelter or even pet shop for permission to photograph their animals. A well-spent afternoon taking pictures can supply you with material for months of drawing. (Just remember to take plenty of spare rolls of film.) Here are some ideas to get you started with drawing your favorite furry friend or wild creature. Use lines to reflect the animal's personality: a soft-focus pastel kitty, or a spiky pen and ink? A lazybones flowing-line pen pooch or a bouncy, energetic graphite gopher. Practice drawing the animal in motion. Spend some time watching your pet, or on a portable chair at the zoo, doing quick thumbnail sketches that capture the main forms and movement. For more on quick sketching, try this article on sketching cats. Look at some old drawings. What did you have the most trouble with? Eyes? Paws? Do a whole page just of that part. We have a tendency to humanize animals or treat them like cute babies. Try experimenting with compositions that will show the natural dignity of your subject. There are long traditions of painting and drawing domestic and wild animals that you can draw on - looking back at art history is a great starting point. Try drawing your favorite horse in the style of George Stubbs, for instance. Take a virtual safari: do some internet research on a distant, exotic country. Draw the animals you might see if you traveled there. You could print out some items -- flags, maps, diagrams -- to add as collage pieces. Check out a tutorial on drawing all kinds of animals in How to Sketch at the Zoo. 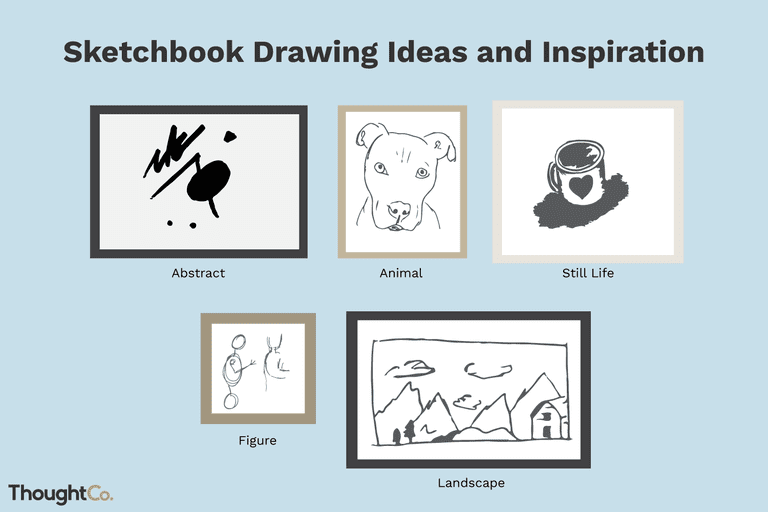 Create a series of drawings each featuring a different breed or variety of the same animal. In each drawing, look for the identifying characteristics of that breed. For some creatures, subtle differences will need to be observed, and you'll need to carefully select poses and angles to facilitate this. For others, the differences will be very obvious. You might like to isolate the animal on a white page, or set them in a typical environment. This project is about communicating visual information through drawing, with a correct observation of both form and surface detail being important. Follow your pet through the day with your sketchbook or camera. Record them sleeping, playing, eating, and interacting with other pets or people. You could do a mix of quick sketches and more detailed realist works. This project is about capturing personality and relationships, so while accurate observation is important at times, the focus is on capturing their quality of movement and expression, as well as allowing feelings to show in the kinds of marks that you use. Experiment with mark-making: Create patches of scribbles and squiggles. See how many different types of mark and texture you can make. Try aggressive, harsh, angry marks. Make smooth flowing lines, both continuous and short. Make rhythmic, orderly marks and random crazy ones. Illustrate a favorite text: Literature has inspired many artists. Think of a favorite poem, novel or play. How do you envision the scene or the characters? What atmosphere has the author created? If you were making a backdrop to a scene, what sort of texture would you use? Respond to a text without actually illustrating it: How does a certain poem, story or song make you feel? Try to translate that emotion into marks, shapes, and colors on the page. "Destroy" an image: Start off with a photocopy of a realist image, and deface it. Tear the surface with tape, add layers of texture with restoration paper, thick pencil, and collage. Be aware of copyright issues with collage materials.